The Autobiography of Thomas De Witt Talmage, he was one of the most prominent religious leaders in the United States during the mid 19th century. His sermons which have been put into writing are convicting, informative and well worth reading or listening to, just as his life is. Full of the spirit of God his life is a testiomony and encouragement even today, years afterhis death. This book was written by himself and his wife, Eleanor McCutcheon Collier Talmage. 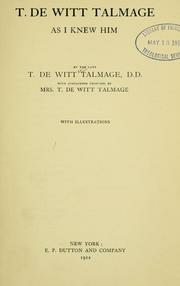 The first 17 chapters written by Mr. Talmage and the last five were witten by his wife.